Happy Monday! I had a wonderful weekend and am keeping up with my goal of running. Friday I ran before work and Saturday had an amazing workout. M and I got up to Santa Cruz by 9am and beat all the traffic. It was 100 degrees in San Jose and Santa Cruz was a perfect 82. We set up our towels on the beach at the Santa Cruz Beach Boardwalk and ran up and down the beach. It was about 1.5 miles from one end to the other and we did that twice! Yup, 3 miles on the beach plus 100 sit ups and 100 squats. I was sort of a wimp and ran with my running shoes on and he did it barefoot. What a pro. I couldn’t handle it but I know that’s totally not what running on the beach should be, but I had to. It was still amazing and believe me it was a tough workout! I love the smell of the ocean and sun tan oil and listening to the yelping sea lions under the pier. I discovered that I usually only run on the beach on my vacations but driving up to the coast and doing it on an early morning is so much fun! Only 40 minutes away from home and it feels like a mini vacation! After our workout we walked up to the boardwalk before they even opened and bought some tickets for the rides. I was so excited to be there and M and I were reminiscing of our childhood trips to the boardwalk and how everything was exactly how we remembered. We rode the Log Ride and got drenched and then the historic Giant Dipper which was a blast. After the rides we took a stroll down to the pier aka the Santa Cruz Wharf and walked around and acted like tourists which was fun. We ended up in the cutest wine bar, Prima Vino, which had amazing views of the ocean. We enjoyed some scrumptious mimosas with fresh fruit juice which was in an ice bin so we could make whatever we wanted. I chose guava for my first one and POG juice for my second. For those of you who have been to Hawaii you know that’s Pineapple, Orange and Guava juice. Delicious! It was such a beautiful day and I am so excited to go back up to the beach and run on some early morning weekends. 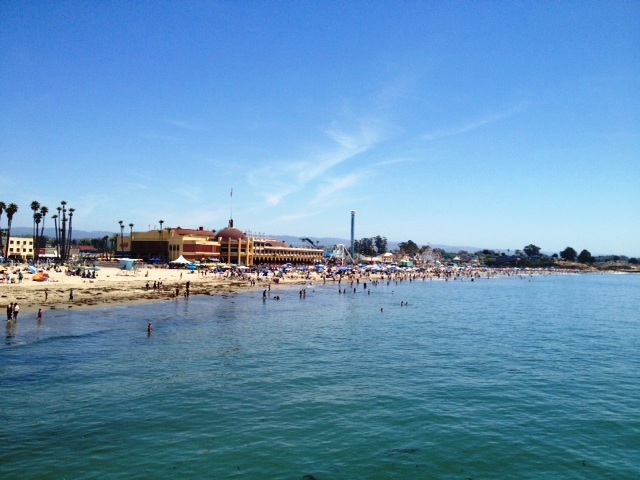 Posted in Posts and tagged beach, running, Santa Cruz, Santa Cruz Beach Boardwalk, Santa Cruz Wharf, Saturday, workout. Bookmark the permalink.